I am writing to you on behalf of the Kihei Community Association (KCA), its board of directors and the South Maui community at large. KCA and its members are deeply concerned about the proposed Pi’ilani Promenade retail outlet commercial development located mauka of the Pi’ilani Highway just south of the existing industrial complex off Ohukai Street. We are informed that the administration is currently in the process of issuing permits for the development. We ask that you give a second look to assure that this project is in compliance with the Kihei-Makena Community Plan, the Order issued by the Land Use Commission in 1995 that is recorded against the property and the Countywide Policy Plan adopted in 2010 before permitting this project. The KMCP is an expression of the will of the people of south Maui and it is the law of the land. It contains several provisions that bear upon the proposed Pi’ilani Promenade project, none of which support it. The following planning standards are specific guidelines or measures for development and design. These standards are essential in clarifying the intent of the land use and urban design objectives and policies. As you can see, the Pi’ilani Promenade project fails to comply with the KMCP. By any measure, the Pi’ilani Promenade retail outlet shopping center represents sprawl eschewed in the MCCPP. The developer’s own words and publications bear this out. For instance, in the online brochure for the shopping center, the developer notes that the proposed center “benefits from sitting at what is projected to be the largest intersection on the Island which provides easy access to tourists, the permanent population and vacation home owners.” There is no mention of pedestrian or bicycle access because this project is automobile-centric. The Pi’ilani Promenade shopping center fails to comply with the letter and intent of the MCCPP, that governs how we will create a desired future. The MCCPP also lends support to the existing KMCP that calls for concentration of retail/commercial development in specific areas, none of which include this project’s location. Record the conditions imposed on the land with the Bureau of Conveyances. “With respect to the pending subdivision application for the above referenced property, please be advised that there are no deed restrictions or covenants applicable to the subject subdivision.” The preliminary title reports and title insurance policy on file with the county suggest otherwise. In conjunction with the application by Kaonoulu Ranch for reclassification, and as required by LUC administrative rules, a traffic study was prepared. The traffic study was submitted based on construction of an industrial complex, not a retail outlet shopping mall and thus is of no help assessing the impact of the use now contemplated. Additionally, the traffic study is seventeen (17) years old. Also, while the public was given an opportunity in 1994-1995 to comment on the property’s development into a an industrial complex, there has been no opportunity for the public to comment on the new use, one with significantly different impact on the community than that which would flow from a true light industrial complex and one that was approved in a different era. While the KMCP was amended as required by the LUC, it was amended to accommodate a light industrial park with only incidental commercial intrusion (see above discussion of the KMCP). For the above reasons, the Pi’ilani Promenade project fails to comply with the LUC’s Order. Will destroy any hope of containing further sprawl in Kihei and South Maui, a community that is in sore need of good community planning and targeted, smart growth. 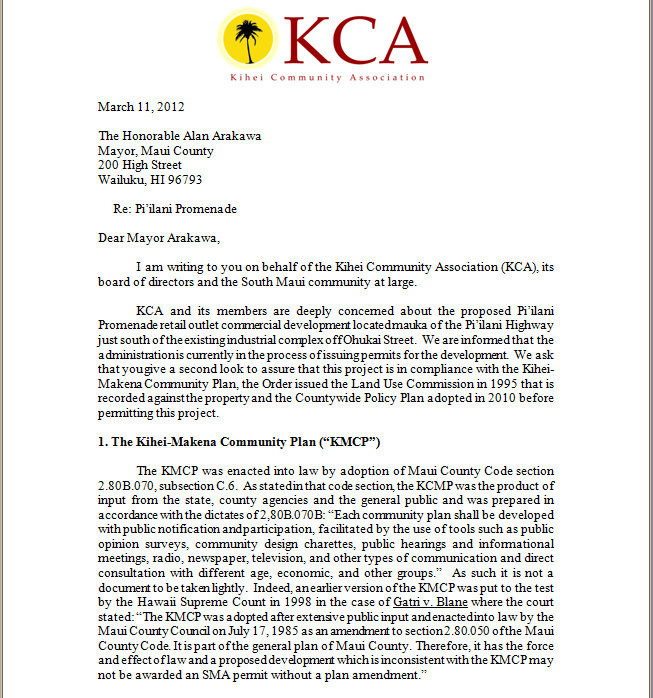 KCA and the community for which it speaks urge you in the strongest terms to assure that this project is in compliance with the Kihei-Makena Community Plan, the Maui County Countywide Policy Plan, and the Land Use Commission Order before issuing any building permits. We request that you respond to this inquiry and address these perceived conflicts as stated herein above. What should be done to the damaged reef off Keawakapu Beach? Jon!! YOU ARE BRILLIANT!!! and a big fat bow to the KCA, for looking out for this community. Mahalo to everyone who has helped with this project! I am thrilled. Thank you very much for addressing this very pressing issue. I really look forward to the Mayor’s response. Respect for the community plan is so important, otherwise what is the point of having a community plan? your letter was a good chronology of the events leading to this new development. It is hard to understand how our county government has allowed this to move forward. Frustration and lack of trust is not what the voters of Maui deserve as we see what they propose for the future of our community. Mahalo for all the postive commnents on this issue. Foster, KCA sure would like to hear the results of your meeting this morning with Councilman Couch. There are bills being voted on as we speak that could possibly supercede the county and public process on what are called “Exemptions to exceptional projects”if we don’t speak up. Check out Senate bill SB 2927.We need to stay on top of this kind of thing as an association. This is my response yesterday on April 20, 2012 to the bill and Senator Cynthia Thielen’s response to mine which could relate possibly to the Eclipse Mall and Promenade if the legislative bill passes. The below was my response that I sent to all the Senators and Reps. Rep Cynthia Thielen just responded. Not sure the outcome of the whole vote in the Senate or the House bills. NO to SB 2927. NO EXEMPTIONS for elite exceptional developers of exceptional projects. The developers should be disciplined enough to meet deadlines and follow due process and particularly, obtain input from the community on the projects. This bill is a Trojan Horse to implement runaway developments in the islands. We need to take care that Short-sighted legislation not destroy our island home.” Developers should be transparent enough to allow for input and adjustments to the context of the project with how it fits for the island, let alone the particular town’s view of the development. Plus, something even better can come out of input from the community. Please, Do not allow bi-pass of this valuable process with communities and the whole island on major projects. Currently there is an issue on the Eclipse Mall and Promenade on 60 acres in prime location that was not given public input which just came up at the Kihei Community Assoc. meeting on Tues April 17 on Maui. This needs to be revisited just as one example. While there can be a reactionary element without knowledge, there are planners and concerned, aware and experienced individuals who can make valuable contributions to the process. Mahalo, Mahalo, Mahalo, for speaking out and voting against these “Trojan Horse” bills and actions bypassing the community in detriment to the health of precious land, livelihoods, and lives. I’m watching cement pouring over our green open space in Kahului, and now being proposed over Kihei. We are being suffocated and losing the very breath of the Aloha Spirit. I add my voice and efforts to keep Kihei and all of Maui alive, healthy and sustainable…. The future is NOW….. The proposed two giant Kihei malls off Pi’ilani, encompassing 75 acres, and projected to create huge volumes of traffic (according to the developer PR), has State Land Use approvals for a “light Industrial” project. Although “light industrial” usually allows commercial, the original approval was given only after conditions were included to specify this as a mostly light industrial area, with little traffic, a frontage road and “minimal” commercial. The Community Plan also has specific language for “minimal commercial” for this area. Residents of South Maui are upset about the potential traffic, impacts on local businesses, and the addition of large impervious parking lots that will exacerbate flooding. Yet the County is not requiring the developer to comply with the Kihei-Makena Community Plan nor State Land Use Commission project conditions. Instead, heavy traffic-producing, retail stores with parking lots four times the size of Costco’s are being given a green light in violation of the projects’ original conditions. Please ask your County Councilmember to READ the original LUC conditions and then ask the County Planning Dept. TO COMPLY WITH THOSE CONDITIONS!